Jay Cutler was great. The defense was great. And the Bears dominated a team someone (me) told you was a great match-up for them. Rapid fire. The pass rush did exactly what it should against that Vikings offensive line. Minnesota had no answer for McPhee, Floyd or Hicks. Jordan Howard is the real deal and it seemed John Fox came to that realization at some point Monday night. This is not a player who should be rotating at the running back position. He is their best runner at the position, their best pass catcher at the position and a solid pass blocker. Spell him, of course, but he should be getting twenty-five touches every week. Two plays stood out to Jon Gruden Monday night when it came to Cutler. One, obviously, was the step up in the pocket shuffle pass to Howard for a big gain. The other was far more subtle. Later in the game. First down. The pocket collapsed on Cutler and he scrambled to his left and ran for a gain of one or two. Was it a big play? No. Does Brian Hoyer lose seven or eight yards on it? Absolutely. That’s the difference. My favorite Cutler moment? Passing on the opportunity to launch the ball downfield to Deonte Thompson in favor of the safe checkdown to Zach Miller. Maturity? Comfort in the system? Zach Miller is a solid, reliable tight end. Alshon Jeffery’s performance early in this game was…absurd? Cutler’s first throw to him in the end zone was high but AJ had no idea where the ball was. He then had two balls go off his helmet, including an easy touchdown reception. Jeffery is a terrific receiver and the Bears should make him part of their future but he ain’t Julio Jones or AJ Green or Antonio Brown or Odell Beckham Jr. The Bears can’t pay him like he is. The coverage skills of Trevathan and Freeman do something the defenses of last few years could not do: force opponents to fight hard for that one yard on third-and-one. Those Kyle Rudolph flat catches would go for a dozen yards a clip in years gone by. Bears started Bausby, LeBlanc, Larsen and Kush and all of them played pretty well. That’s coaching. 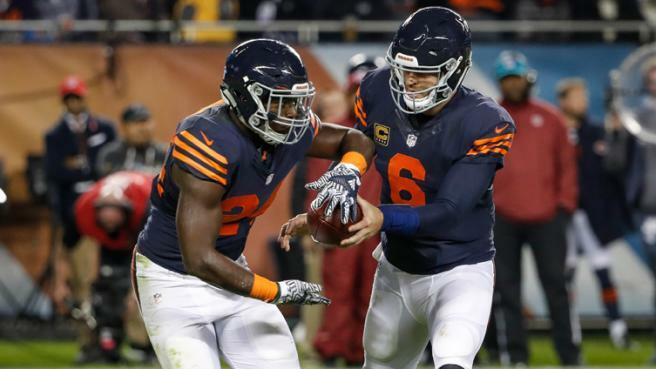 Dowell Loggains calls an entirely different game for Cutler than he did for Hoyer. He trusts Cutler. It’s obvious. Forget about the Vikings going to a Super Bowl. That team last night could easily miss the playoffs if they don’t fix their offensive line. And even if they do fix their offensive line, that collection of offensive talent stinks and will stink worse when the line gets Bradford seriously injured in the next few weeks. How is this year’s draft class looking? Floyd. Whitehair. Howard. You have a couple drafts like this and a contender emerges. Will Sutton plays small. Bears will be even better defensively when Goldman returns. Full disclosure. I’ve given Pat O’Donnell the benefit of the doubt because he’s been a guest on my pod twice but he’s just not any good. He never bombs one when the Bears punt deep in their own territory and NEVER pins the opponent to their goal line. With the Bears building a bully defense, they must address this position. Ben LeCompte is not on an NFL roster. Bears have two weeks til they play a game. Bring him in. Adrian Amos is a bopper at safety but the Bears need a safety with ball skills and right now they don’t have one. HJQ is far too often out of position. Couple nice flashes from Jonathan Bullard and Corny Washington, moronic penalty aside. The night belonged to Cutler, especially when Jeffery revealed postgame that it was Cutler’s inspirational address that fired the team up. I argued this was the most important nine-game stretch of Jay’s career. If he plays eight games like last night, he’s going to make it easy for Pace and Fox to look elsewhere in the front half of the first round.